Ungulates are an extraordinarily important group of animals worldwide, at many levels - in their remarkable biodiversity; in many cases, as keystone species with a disproportionate effect on the functioning of the wider ecological systems of which they form a part or as dominant species acting as ecological engineers; and as a prey base for endangered or expanding populations of large carnivores. They are also important culturally and economically, as a major source of protein in subsistence cultures and because of their wide exploitation in recreational hunting, which is still a major form of land-use in many countries. 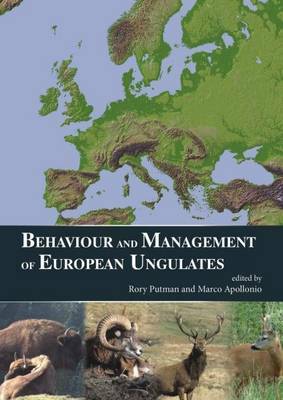 A number of aspects of the balance of cost and benefit of ungulates and their management in Europe are considered. Through a synthesis of the underlying biology and a comparison of the management techniques adopted in different countries, management approaches which seem effective within their respective circumstances are explored. Each chapter is written by experts in their own particular field, ensuring that they are aware of the most up-to-date literature on that topic and can also offer an experienced and informed review based on their own research experience.